Here we are going to see how to find the angle between two straight lines. Here m₁ is slope of the first line and m₂ is the slope of the second line.To find angle between two lines, first we need to find slope of both lines separately and then we have to apply their values in the above formula. Here you can find two example problems to understand this topic clearly. To find the angle between two lines we have to find the slopes of the two lines. 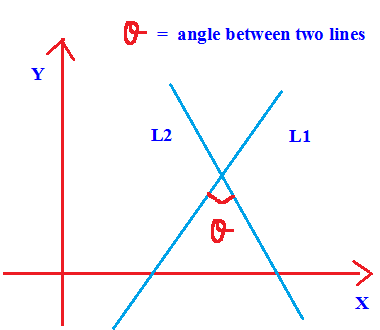 To find the angle between two lines, we have to find the slopes of the two lines. After having gone through the stuff given above, we hope that the students would have understood "Angle between two straight lines". Apart from the stuff given above, if you want to know more about "angle between two straight lines Please click here.